The wind work package of the Natural Hazards Partnership's Hazard Impact Modelling project is led by the Met Office. There are currently three wind hazard impact models for a range of assets. These are the Vehicle OverTurning (VOT) model, the Bridge Model and the Camping and Caravanning model. The models aim to aid decision making, by providing impact information, in the issuing of the National Severe Weather Warning Service wind warnings to the public. The VOT model forecasts the Risk of Disruption on the UK road network during a high wind event. This risk value highlights the potential disruption or impact caused should a vehicle overturning event occur on a particular road. The VOT model is used by meteorologists at the Met Office to improve the understanding of risk on the road network during wind storms. The VOT model uses probabilistic wind gust and direction data from the high resolution Met Office Global and Regional Ensemble Prediction System (MOGREPS-UK). This hazard probability is combined with vulnerability and exposure values to give an overall Risk of Disruption on the UK road network due to a vehicle overturning value. This risk algorithm uses a number of datasets to produce values for the vulnerability and exposure elements (below left). 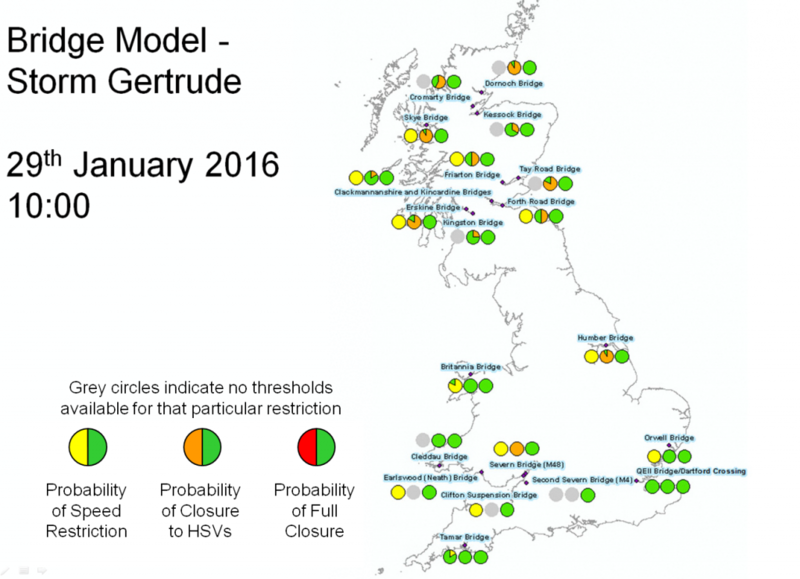 The VOT model output from Storm Gertrude on 28th and 29th January 2016 (below right) show the Risk of Disruption changing over time as the storm moves across the UK. On the 8th January 2015 the VOT model was used as evidence to update and issue National Severe Weather Warning Service wind warnings. The original warning (below left) had been issued by the Met Office on the morning of the 8th January. At 02:00 on 9th January the forecast from the VOT showed medium to high risk around the Central Belt of Scotland (below middle). The warnings were amended and a new amber warning issued for the Central Belt of Scotland based on the VOT model Risk of Disruption forecast (below right). During the wind storm 18 vehicle overturning and travel disruption events were recorded by news outlets, social media, Highways England and the Met Office's Weather Observation Website. One of the events recorded occurred in the amber warning area in the Central Belt of Scotland and others were reported in the extended yellow warning area. The VOT model showed to be a very good forecast and helped decision making during this event. The Bridge Model forecasts the probability of bridge restrictions and closures for 20 bridges in Great Britain. Below is an example of the Bridge Model output from 29th January 2016 at 10:00. Storm Gertrude hit the UK on the 28th and 29th January 2016 and caused numerous impacts including bridge closures. The Camping and Caravanning Model is an innovative and unique model which forecasts risk of camping and caravanning disruption during high winds. It is best used to highlight risk during the summer months when people are more likely to be camping. Relatively low wind gust values (30 mph) can cause impacts to camping in tents. The model uses the same risk algorithm at the VOT model but with different, more relevant, datasets for vulnerability and exposure. A camping and caravan site location database, created by the Health and Safety Laboratory, identifies 9806 site across Great Britain which are input into the model. The model has two additional features: closure of site during winter whereby location points are removed when the site is closed and the inclusion of large music festivals (shown by triangle symbols). Music festivals are more at risk to be disrupted by wind due to the number of people attending and camping. On the 10th and 11th August 2014 ex-hurricane Bertha swept across the UK. The example below shows output from the Camping and Caravanning model. The animation includes: music festivals (shown by the triangles), impact observations from the Met Office Weather Observation Website (green circles), the National Severe Weather Warning Service warnings and their validity time (bottom right) and wind forecasts from the high resolution UKV model (top right). It's difficult to determine if the Camping and Caravanning model verified well due to the nature of impacts reported at campsites. The few reported impacts are in the area where increased risk of forecast by the model.